Noctua's DX line of coolers has become a default choice in high performance quiet cooling solutions for Intel Xeon CPUs. The i4 revision supports LGA2011 (both Square ILM and Narrow ILM), LGA1356 and LGA1366 based Xeon platforms and the new D9 model provides better performance and better compatibility than previous 9cm versions: Thanks to its 95x95mm footprint and reduced 110mm height, the NH-D9DX i4 is fully 3U compliant and clears the RAM slots on LGA2011 Square ILM and LGA13xx. At the same time, the dual tower design and the new NF-A9 PWM guarantee further improved quiet cooling performance. 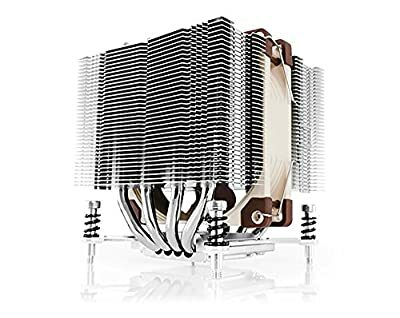 Fitted with the professional SecuFirm2 mounting system and bundled with Noctua's industrial-grade NT-H1 thermal compound, the NH-D9DX i4 3U forms a complete premium quality package for quietly cooling Xeon based workstations and servers. The NH-D9DX i4 stands only 110mm tall. This is 15mm less than previous 4U compliant 9cm DX-line coolers and allows the NH-D9DX i4 to also fit 3U cases - ideal for noise-sensitive 3U applications in fields such as audio or video processing! With its 95x95mm footprint, the NH-D9DX i4 does not overhang the RAM slots on LGA2011 Square ILM, LGA1366 and LGA1356. This gives the user full access to the memory modules and guarantees 100% compatibility with tall heat spreaders or optional memory fans. The NF-A9 92mm fan supplied with the NH-D9DX i4 supports PWM for convenient automatic speed control through the mainboard. And, the maximum fan speed can be reduced from 2000 to 1550rpm using the supplied Low-Noise Adaptor for even quieter operation The NH-D9DX i4 includes an extra set of fan mounting clips for users who want to achieve even better cooling performance by adding a second, optional NF-A9 to the front fin stack. Using the y-cable supplied with the NF-A9 PWM retail fan, both fans can be connected to one CPU fan header.